One can say about this flower: and how could I handle without it? Anyway, our mothers and grandmothers can’t imagine how one could not have at home such useful plant as kalanchoe. I remember we also had such one at home. 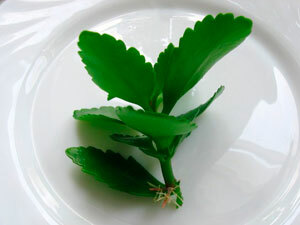 And there is no wonder, as kalanchoe is a medical plant and it’s used medicinally for colds, cough, cuts and burns. Just for these purposes, I have begged my mother-in-law to give me already well grown up flower. In one word, kalanchoe is the flower, which is worth your efforts for care of it. And to prevent from wilting of such precious plant, let’s refresh our knowledge about care of kalanchoe at home. The tree of life, room doctor, room ginseng – what names kalanchoe didn’t get for its usefulness. Despite all varied types look differently, all of them possess healing qualities. There are more than 200 kinds of kalanchoe in nature. Only some of them are grown at home. 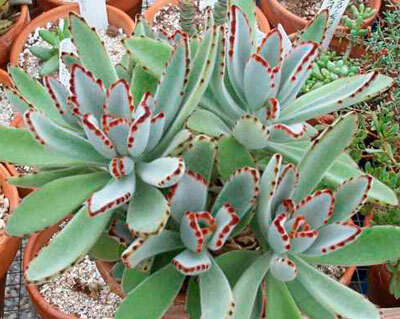 Typically, it’s Bryophyllum pinnatum, Bryophyllum daigremontianum, Kalanchoe blossfeldiana and Kalanhoe uniflora. 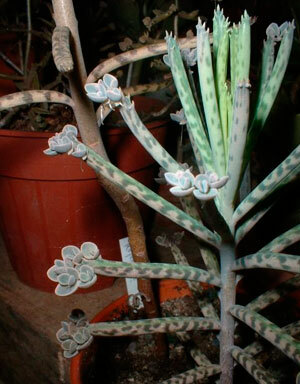 But whatever the type of kalanchoe you get, care of any representative of this plant at home is almost similar. As all of them refer to stonecrop family. These plants are habitants of tropic. They are adapted for long stay both in draught conditions and in conditions with high humidity. 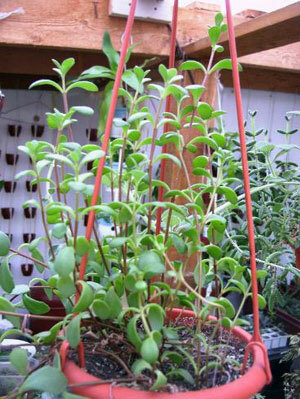 In kindly periods, leaves of kalanchoe gather a moisture, which then can be used by plant for survival. Also this flower doesn’t need in fertilizing and replanting. One can say this plant gives us more than requires. Also these houseplants are characterized by persistence to diseases and blasts. Furthermore the plant that just started to taint, you can divide it into cuttings and implant it. They propagate easy and often with the help of bulbils by themselves. But in spite of unpretentiousness of this plant, one should remember how to care of it at home. Almost every corner in the home, where even a little sunlight can direct, will be suitable. It is easily grown both in half-shade and in conditions of diffuse sunlight. If you put it under direct sunlight, then there just will be a little change in coloration of leaves (they will become slightly red). But east or west window, where lightning is not so intensive, will fit the best. For bloomy types of kalanchoe east or southeast direction and optional lightning in winter period is preferable the most. When 3333is obvious lack of lightning, the plant stretches and grows weak. The upper leaves turn pale and the lower ones die down. Temperature conditions for this plant are also more or less free. When it’s 10oC outside, it can be set on the balcony in the fresh air, where kalanchoe can be all summer-autumn season. It can stand heat stoically and handle it easily. But it’s necessary to increase watering to avoid withering of flower. The best temperature for kalanchoe in summer is 23-25°С and in winter is 12-16°С. As it was mentioned, the plant gathers a moisture in the leaves. So it can easily stand a period of forced draught, for example when you’re not at home. But overwatering has a harmful effect. And the reason is not in amount of water. While watering, soil must be heavily moisten in order to wet completely the ball of soil. But the rest of it should be poured out. In order not to commit it, all you have to do is choose the frequency of watering. The ball should dry out between the water procedures. You can water it more often only during the heat. But in the winter do it as seldom as possible – once every 10 to 14 days. If you overwater it, the roots may start to taint. Also excessive watering may cause fungus and molds. Essentially, you cannot spray it at home. In the winter, it’s even dangerous at all. But to save the plant from dust on the leaves, it’s advisable to wash it under the shower. It’s also useful to wipe leaves with soft cloth to prevent appearance of red spider or mealybug. It’s a very important condition exactly for bloomy types of kalanchoe. You have to cur cardinally. Flower stalk should be taken away as low as possible to avoid tainting of the rest part. Also flowering makes the plant weaker. All old parts of the plant should be cut off. The strong green cuttings also should be cut off and use for rooting. How to avoid problems with Kalanchoe? It would be good to carry a pinching of flower tips to form spurs. Otherwise, the plant won’t look nice while stretching and growing. Sometimes kalanchoe needs to be fertilized, approximately once a month. Fertilizers, which are used for succulents, are suitable for it. Bloomy types of this plant is better to fertilize with complex fertilizer, otherwise it won’t bloom. But you need to take only a half of required dose on the packaging. 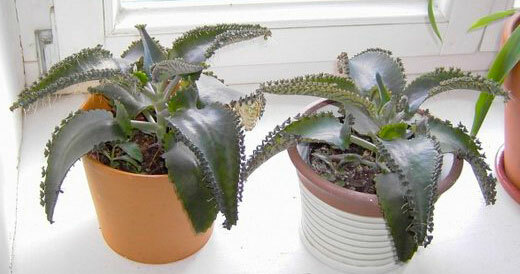 After all, too many fertilizing is harmful for kalanchoe. One cannot feed it in winter. Kalanchoe refers to fast growers, that’s why requires frequent replanting – once a year, in the end of March. You can add new soil in adult plants but on the condition that roots won’t be beyond the pot. 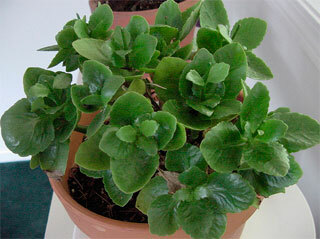 Kalanchoe needs to be replanted in the pot bigger than previous one to 2-3 cm in diameter. While replanting, you have to take out the flower very carefully as it has very fragile leaves and stalks. The ground may be of such compound: humus (1 part), leaf mold (1 part) and sand (1 part), also there can be added vegetable soil. Kalanchoe is really very useful plant. My grandmother always kept him in the house. Always winter some drops and tinctures made from it. It should be noted that my grandmother was sick rarely. Pot kolanhoe always stood on the window sill where the sun was a great afternoon. Grandma often loosen the soil but rarely watered. And of course, about once a week cut short leaves that she did not like. In this I am happy to help her.